Sen-nen Joô (1982) - Sci-fi-central.com. Japan  1982  121m   Directed by: Masayuki Akehi.  Starring: Keiko Han, Keiko Toda, Ichirô Nagai, Mami Koyama, Yôko Asagami, Akio Nojima, Tôru Furuya, Kazuko Sugiyama, Eiko Masuyama, Ken'ichi Ogata, Keaton Yamada, Kazuyuki Sogabe, Hideyuki Hori.  Music by: Kitarô. In the year 1999, astronomer Professor Amamori has discovered a tenth planet within the solar system. Unfortunately, he also discovers that it is set to collide with the Earth on 9 September 1999, at 9:09:09 AM. Professor Amamori makes preparations to save the planet, aided in his campaign by his nephew Hajime and his secretary Yukino Yayoi. Unknown to anyone, Yayoi harbours deep secrets: LaMetal crosses paths with Earth (and wreaks chaos) every millennium, it is home to an advanced civilization who enslave any human survivors of the cataclysm, and she herself is the Millennial Queen, a special citizen of La Metal who comes to Earth every 1000 years to prepare for the this passing. However, she also hopes to save Earth, for though she is from LaMetal, she cannot stand aside and let her home world destroy the planet and its natives that she has come to love. 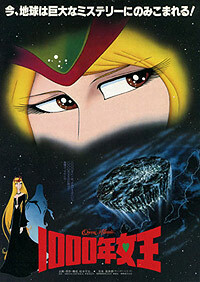 QUEEN MILLENNIA (1982) is a two-hour theatrical feature film adapted from the 1981 Japanese animated TV series of the same name, created by Leiji Matsumoto, and was one of a sterling group of popular anime features spun off from space sci-fi TV series of the late 1970s and early 1980s. These included the five SPACE BATTLESHIP YAMATO movies, the three MOBILE SUIT GUNDAM movies, SPACE ADVENTURE COBRA and SPACE WARRIOR BALDIOS, as well as three additional works penned by Matsumoto, GALAXY EXPRESS 999, ADIEU GALAXY EXPRESS 999, and ARCADIA OF MY YOUTH (the Captain Harlock feature). QUEEN MILLENNIA retells the story told in the 42-episode TV series, which dealt with the disastrous approach to Earth of La Metalle, the home planet of the title Queen who resides on Earth during her thousand-year reign, during which La Metalle makes its elliptical thousand-year orbit stretching outside of the solar system. The current queen, Yukino Yayoi, has been living life as a pretty blond school teacher and part-time lab assistant (apparently the Queen Millennia gig doesn't pay very well!) and is shocked to discover that her fellow La Metallians have secret plans for Earth that involve displacing the planet's population. She resolves to fight back and defend her beloved Earth, with the help of her astronomer boss, Professor Amamori, and his precocious nephew, Hajime. Also on hand are a pair of Yukino's La Metallian partners, her sister Selene and her male assistant, Yamori. Complicating matters is the fact that the La Metallian invasion fleet is commanded by Yukino's home planet boyfriend, Fara. The stage is set for a pitched interplanetary battle, with the Earthmen relying on Yukino's massive underground ship, the "Ark," which emerges from hiding just in time to confront the La Metallians. As in so many of Leiji Matsumoto's works, the extraordinary events unfold largely through the eyes of a young boy, in this case Hajime, who is traumatized early on by the death of his parents in an explosion related to the manufacture of parts for the Queen's Ark. As an amateur astronomer and one of Yukino's adoring students, he's a little more sophisticated than Tetsuro, the poor boy in shabby cloak and battered hat who's the hero of "Galaxy Express 999." Yukino carries most of the dramatic weight of the film. She spends a lot of time pleading with her counterparts back on La Metalle and, once she's made up her mind to resist, she confronts Selene and Yamori to determine the extent of their loyalty to her. At other times, she's busy consulting with Amamori and Hajime, neither of whom learn of Yukino's true identity for some time. The dramatic scenes are interspersed with spectacular sequences of mass destruction as the entry of La Metalle into Earth's gravitational pull causes waves of asteroids to hit Earth's surface and tidal waves to flood the cities. The almost masochistic emphasis on such catastrophe threatens at times to overwhelm the human characters, although one harrowing, suspenseful sequence during the asteroid attack focuses on Hajime as he ascends the stairs of the ruined skyscraper where Yukino lives, desperately searching to see if she's alive. Unlike the TV series, the movie is framed against a more deliberately futuristic setting, with Tokyo presented as a sprawling high-tech cityscape with looming skyscrapers and air cars speeding over long, looping highways. Both are set in the then-far future year of 1999. It's all very beautifully done, with the kind of baroque design touches that so often distinguished works based on Matsumoto. The futuristic trappings are all rendered in deep, warm colors and rounded shapes. The costumes tend to be based on past eras. In the climactic battle between Earth and La Metalle, the Earth men use archaic weapons taken from the History Museum, ranging from WWII-era tanks and fighter planes to ancient catapults and cross-bows. The short, rounded cartoonish design of Hajime and Amamori is contrasted with that of the tall, slender, attractive women around them and the long-haired, fairly realistically-drawn men from Yukino's planet. Underscoring it all is a rich, evocative music soundtrack by New Age composer Kitaro. There are some memorable wordless musical sequences, such as one showing the people of La Metalle slowly emerging from their thousand-year sleep and awakening to embrace each other and enjoy the "Spring" on their strangely colorless planet. Another sequence has Hajime being shown aboard the underground Ark and led down a very long corridor housing the dead former millennial queens as we see images of them from the past slowly flying by. Much later, three of these queens, all famous figures from different countries' lore, Himiko (Japan), Yang Kwei Fei (China) and Cleopatra (Egypt), come to life to aid the current Millennial Queen. It's an emotionally moving, exquisitely designed work, one of the best to emerge from the pen of Leiji Matsumoto, and it deserves to be seen in the U.S., where it is not currently available. The lovely end song is sung, in English, by Dara Sedaka (daughter of one-time American pop star Neil Sedaka).